Just a quick post to draw your attention to the work of Ron Rosenstock. He's an American photographer who is a follower of Ansel Adams (which really shows in his photos) and was a student of Minor White. A solid provenance. He does take other kinds of image but he does have a significant body of work in infrared, which I'm just starting to explore. He has produced a book called The Invisible Light, which reminds me I still have to do some work on my site of that name. Ron's web site is www.ronrosenstock.com. Ed Thompson's fascinating book, The Unseen, which I recently wrote up, is being launched this week. 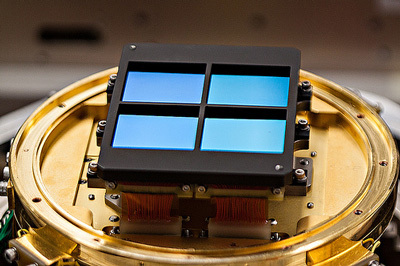 Unusually, the do is an open house and might provide an opportunity for an infrared get-together ... I certainly plan to go. "I will be holding a free raffle and giving away prints, original spreads from the book when it was printed and other cool rare stuff to do with the project." 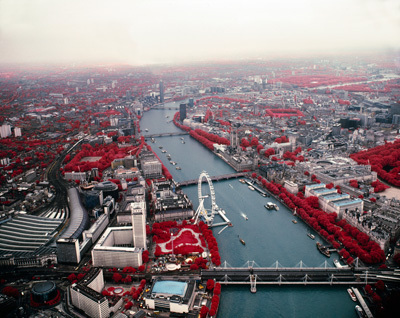 Coincidentally, last time I went to the Photographers Gallery was to see some of Richard Mosse's infrareds from the Congo ... but in that case the book was unobtainable. If you are heading down the Kings Road between October 28th and November 4th, I recommend you drop in at number 259. That's the shop and gallery of Green and Stone and they are hosting an exhibition of Simon Marsden's infrared photographs. Being a Kings Road gallery it's also an opportunity to buy a print from the ever diminishing stock of prints made by Sir Simon himself ... or books (some signed), the 2017 calendar, or cards. (I will admit, sadly, that my wallet tends more towards the latter.) I have to admit that besides the print of Moydrum Castle he kindly loaned to the RPS for inclusion in our Infrared 100 exhibition, I have not seen any of his prints 'in the flesh', and he always saw the printing as a key part of his work. Both composer and player, as Ansel Adams might have said. Opening hours are 0900 to 1800 weekdays, 0930 to 1800 on Saturday and even 1200 to 1800 on the Sunday. There is also a late night opening on November 2nd until 1930 (maybe see you there?). The Green and Stone shop has been in Chelsea for almost 90 years and started life within the Chenil Gallery (apparently situated between Chelsea Town Hall and the Six Bells pub), whose directors were Augustus John and Bernard Shaw, before moving to the present site opposite Carlyle Square in 1934. I've known for a while that the Red digital cinema camera could take great monochrome infrared moving images. For the past few years film makers Glen Ryan and James van der Moezel of silver dory productions in Australia have been working on a tour de force movie to exploit this, called BRINDABELLAS | edge of light . 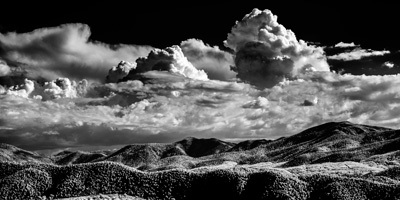 BRINDABELLAS | edge of light is an immersive cinematic journey through the sky and landscapes of the Canberra region of Australia – in particular the Brindabella Ranges. The film focuses on the interplay of mountain light, air and water as these elements are transformed across the seasons – from clouds to mist, rain and snow – then frost and ice – and onto creeks and rivers. It explores both the wider montane vistas of the Brindabellas and the more intimate details of the natural flows that are created by these mountains and, in turn, shape the very landscapes they arise from. The video, shot at 4K resolution, looks superb, exhibiting all the characteristics of near-infrared photography but with the added dimension of movement. The landscapes will look familiar to anyone used to taking such images, with clouds sailing majestically across ink-dark skies above Wood-effect forests, accompanied by minimalist music and effects. There used to be a common phrase in the early days of interactive video ... Every frame a Rembrandt ... and it really applies here. But there are more than landscapes. The area's wildlife is included. Here's where something extraordinary appears, an unusual feature of an unusual movie. Insect chitin, the substance of which much of their bodies is made, has long been known to be transparent at near infrared wavelengths. You can see this demonstrated clearly, and in minute macroscopic detail, in parts of this movie. 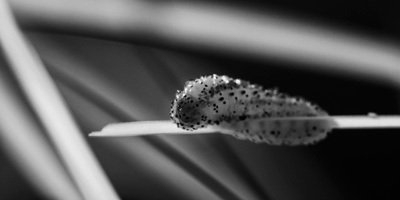 Not just chitin either, I wasn't aware that caterpillars might become transparent (or at least translucent). The film is in 22 chapters, covering five seasons (two summers bookend the production) and you can watch it in up to 4K quality via the production website, YouTube or Vimeo. My 5K iMac can display the 4K movies, given a following broadband wind, and they look superb (although I haven't gone all the way through as yet). 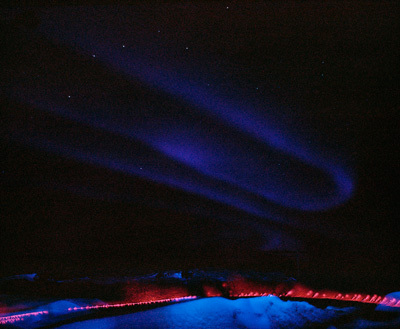 Another Koyaanisqatsi perhaps? PS: Silver Dory have also produced a book/monograph of the project. Selling out fast, apparently. 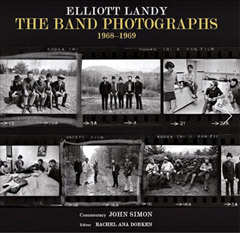 This hardback book isn't your usual photographic monograph. For a start it's just over 260 pages long and then every image is taken using some of the last-remaining rolls of Kodak's colour infrared film. As the back-cover blurb says, this is the swan song of a particular kind of film, and of the particular kinds of images it was destined to take. Ed Thompson is a documentary photographer, and for the past few years he has been exploring his photographic fascination with the different view of the world that this film provides. He has chosen some of the hundreds of potential applications to produce a series of smaller projects which, taken together, make up this book. Superficially, this may lead you into thinking that the book is disjointed, jumping between anatomical specimens, dystopian landscapes, portraits, an operating theatre, the sky at night and even images of paintings. Follow the interstitial text, however, and it will become clear. The photographs look beneath the surface of the subjects, in some cases literally (that is, the medical poses and an Icelandic glacier). Infrared photography, both monochromatic and false-colour, has been used for remote sensing of plant health in agriculture, haze-penetration, imaging veins and other things just below the skin, and layers of artworks below their 'skin'. 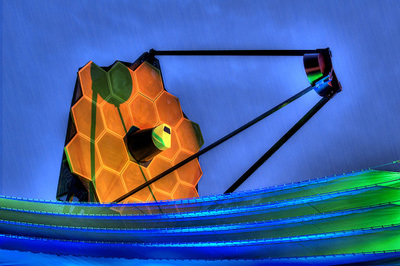 Whereas once infrared was thought of as a branch of astronomy - the 'new astronomy' as it was called - now it dominates the field. 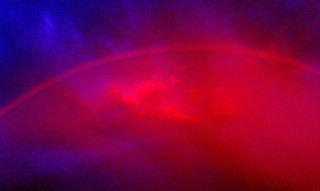 Ed's astronomical photographs are perhaps the weakest in the set but they deserve to be included ... and the Orion Nebula always amazes. I think the book is called an atlas because the twelve chapters document an exploration, although you will find no diagrams showing oceans and mountains. You may, however, find a dragon or two, in the shape of photographs from the dead zone surrounding the Chernobyl power station. For me, these are the most poignant images: using one form of radiation that we can't see to suggest the other, more dangerous, invisible radiation all around. If I have a technical quibble, it's that building a book from images where the predominant tone is saturated red is a printer's nightmare. Print lives in the land of CMYK, not RGB. I started off thinking some of the images were a bit dull, but they actually need quite a lot of light to bring them to life. Persevere, and you will be rewarded. 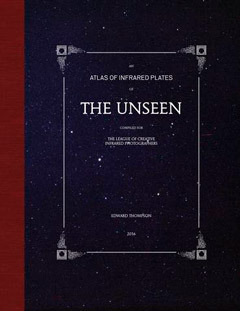 I've collected quite a few books of infrared photography and The Unseen is part of a tiny group specialising in false-colour infrared. 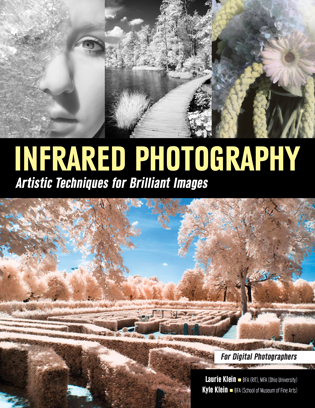 It definitely deserves its place in a photographic library and in the history of the medium: whatever your reason for liking infrared photography, there will be images here to amaze you. Following on rapidly from her excellent book Photographing the Female Form with Digital Infrared, Laurie Klein has joined forces with her son Kyle for a more general coverage of infrared photography. Basically (and simplifying somewhat) Kyle discusses the subject from a technical perspective while Laurie discusses the art and technique. 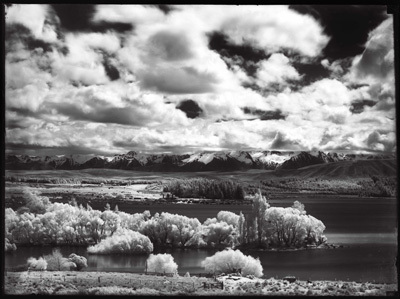 As I noted in the review for Female Form, Laurie studied with Ansel Adams and his fingerprints can occasionally be found in her work. This book even mentions the Zone system, in the context of using the camera's histogram display. For infrared photography, where the captured images often have a restricted palette, the histogram is even more useful than in conventional photography. There's a lot to glean from this book. Personally I find more to learn in Laurie's contributions but that's not to denigrate what Kyle wrote, just where I'm coming from with my research into the subject. What I really like is that post-processing, which is undoubtedly an essential part of digital IR, is placed in a reasonable perspective. The book leads you through the workflow of making the image with the camera and then adjusting it to match the vision. I'm particularly interested in the section on emulating the old Kodak film halation and will be exploring that before long. 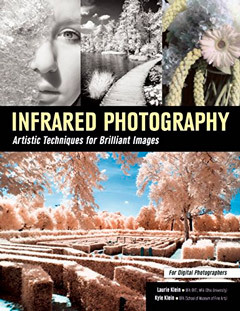 Infrared Photography: Artistic Techniques for Brilliant Images by Laurie Klein and Kyle Klein is published at $37.95 by Amherst Media. I note that Amherst have really upped their game with the printing in their recent books: no complaints on that score. The format fits the usual Amherst US-Letter size, perfect bound. I've also been sent a copy of Karen Dórame's Mastering Infrared Photography by Amherst, which I'll be looking at before long. Last June I had a chance to look at the Flir One thermal add-on for the iPhone. This was based on Flir's tiny Lepton bolometer. This has a resolution of 80 by 60 pixels and is aimed at OEMs to incorporate in various devices. The latest is an Android mobile phone from Reading UK-based CAT called the S60, which was launched yesterday at the Mobile World Congress. The CAT literature doesn't mention thermal resolution, although there is some online speculation that Flir's Lepton is now available with 160 by 120 pixel resolution, as reported by Ars Technica last August. Whatever it is, the CAT device seems to make use of the same blending technology that the Flir one uses to give false-resolution to the thermal image, which makes it much more useful. The visible and thermal cameras are also much closer together in the CAT, which will reduce need to correct the parallax errors at close distances that the original Flir One exhibited. This is still not really of a sufficient 'quality' to be an artistic imaging device, but if you're a plumber, heating engineer or electrician this is a kind of tool that will soon be making its way into your toolbox. You can see the BBC's Rory Cellan-Jones trying one out, and chatting to 'the man from CAT' in this video clip.